Blonde Cocktails and Cavalrymen – Hello Cocktails! This week I’m reviewing a biography of the famously golden-haired General Custer, so I thought it would be a good opportunity to make the “French Blonde,” the recipe for which I found on the Food Network webpage. A note on looks: the Blonde’s appearance is beautiful, I’d love to make a batch of five or six for presentation at a party. They just shimmer and exude this fresh, citrus-smell and tint; in unison, I imagine a half-dozen of them would be quite striking. In terms of taste, this is a great drink, very very citrusy, and celebrates the fresh grapefruit and the soft, subtle elderflower. Even throughout, no big ups or downs, just a nice sipper. Make it, post haste. Looking for Custer-themed drinks I came upon the “Boulder Libation” blog and its rediscovery of the forgotten “Sitting Bull Fizz” cocktail, first published in 1892. I love fooling around with old cocktail recipes and, given Sitting Bull’s leading role in Custer’s demise, thought this would be a good drink to try. I doubled the recipe but if you want a softer hitter, just cut the portions in half. It’s a good evening after-work drink, I thought – strong enough to still taste the bite of the rye, but not overpowering or heavy. The lemon and seltzer make it lively and fun, and would work well sitting out on a patio on a hot evening. 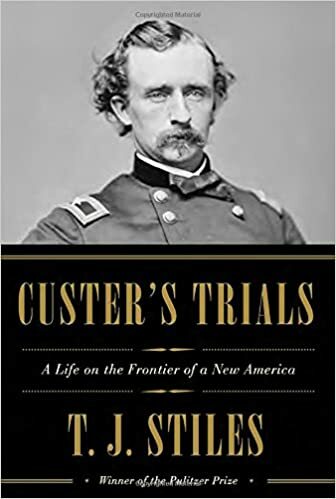 “Custer’s Trials” by T.J. Stiles is history writing at its best – Stiles’ research is exhaustive, bringing to life Custer and the world around him by detailing every letter, every event. If you are looking for a breezy description of Custer’s highlights such as Little Big Horn, this is not the book for you. Detail does not weigh this book down, however, as Custer’s short life was packed with violence, political intrigue, and personal follies. As Candice Millard points out in her excellent NY Times review, the breadth of experiences Custer fit into just 36 year is stunning. Frankly, it shamed me 🙂 The man Stiles portrays is passionate and obsessed with his own advancement. In the Civil War, the 25-year old general proved tactically brilliant but also spent much effort fawning over political suitors. In this, non-military pursuit, Custer was mostly unsuccessful and sycophantic, leading to a steady post-war decline of his career fortunes. While a favorite of the press, he proved a poor peacetime manager, treating men under his command cruelly and attracting the ire of many superiors and junior officers. He was brutal in his conduct of the Native American wars but no more than his colleagues and political masters, who wielded the Army as a rough scythe. Stiles’ description of Custer’s famed final act is breathtaking but, to the author’s credit, reads as the culmination of a fascinating historical tale rather than the crux of the story. Given much of the popular fascination with and knowledge of Custer concerns his last 24 hours, this is quite an accomplishment.